Bound for Glory? 5 key points to building a successful team. 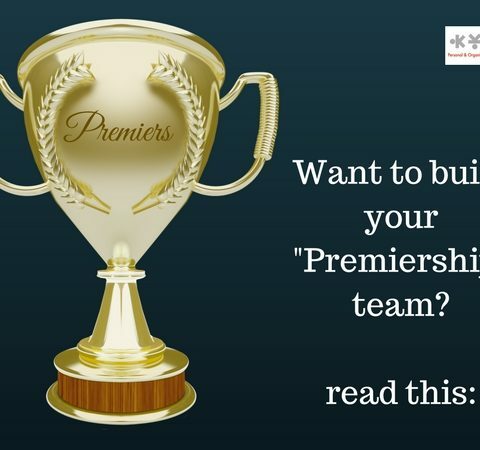 Grand final Day… Is your team ready to claim VICTORY? If we were facing our organisational Grand Final, would we be ready? Who would be our most consistent and when it comes down to it, who can we absolutely rely on to get their job done? Get the wrong people off the bus. Get the right people in the right seats. 2. Ensure the right match for all new appointments. Utilising advanced tools such as DISC behavioural profiling can provide the critical insight required to indicate the type of person (and behaviours) you need within your team. 3. Create Role Clarity. The GAMS tool (GOALS, ACTIONS, MEASURES) is possibly the most under-rated, under utilised gem in the world of Performance Management. Organisations willing to commit wholly to GAMs create individual and organisational role clarity – and reap the rewards of highly motivated, razor sharp teams ready to dominate the arena. 4. Encourage, recognise and reward Discretionary Effort. Discretionary effort is the domain of the one percent extras, that over time add up to make a huge positive impact on organisational culture and goals. Whilst we cannot all be Brownlow Medalists, each player on our team can choose to pitch in to do those extra little bits that drive us towards victory. 5. Revisit and retest your Vision, Mission and Values statements. Are they still relevant and appropriate now and into the future? Do the environmental conditions we experience validate or invalidate them? Are they being upheld? The Leadership At Work team have more than 30 years of experience helping organisations build high performance teams using the five key points above. We invite you to get in touch with us for an obligation free chat about how we apply these points and the outcomes you can expect.